Mobile applications are experiencing an upsurge as businesses use them more and more to extend their digital presence, just as they once moved onto the web. With mobile apps, media companies have opportunities to extend their brands, reach more consumers and generate extra revenue. The most common method for getting the news content nowadays is by going directly to a news website or starting an app on a mobile device, such as Apple iPhone, iPad, BlackBerry, Windows phone, Android mobile digital device. According to recent surveys, nearly half of American adults are smartphone owners, and one in five owns a tablet. A half of smartphone users utilize them to read news. Consuming news is also one of the most popular activities on the tablet, about as popular as sending and receiving emails, and more popular than social networking, gaming, reading books or watching videos, though less popular than browsing the web generally. Mobile applications are getting popular because they usually provide a better experience than just a mobile version of a web site. What makes mobile apps valuable for media companies? The increase in mobile devices represents promising options for news producers, including the increasing amount of overall news being consumed. Mobile apps are focused on interactivity and enhanced legibility, what makes users consume news and data as efficiently as possible. Mobile apps can employ geo-located advertising, enabling media companies and advertisers to target ads very precisely. Therefore, consumers can view ads and offers for products and services exactly in their areas. Getting back to the US market, the majority of Americans nowadays consume news through at least one digital web-enabled device. 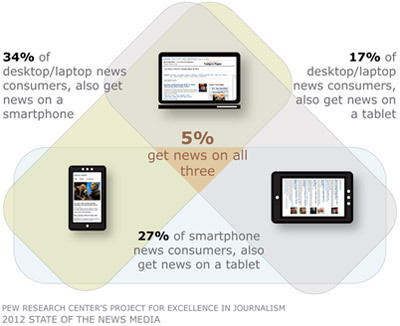 According to the research ‘The State of the News Media 2012’ by the Pew Research Center's Project for Excellence in Journalism, nearly a quarter of U.S. adults, 23%, get news on at least two devices — a desktop/laptop computer and smartphone, a computer and a tablet, a tablet and a smartphone, or on all three. The content is immediately accessible to users in the online mode wherever and whenever they want it. Caching mechanism enables seamless reading also in the offline mode. Improved look, optimized for comfortable reading on the majority of mobile platforms. Greater range of content including in-depth articles with commentaries, high-quality videos and pictures. Automatic updates and improvements of apps. Experts say that the percentage of those who get news primarily through apps will only increase.